What part of the line are you seeing? Here we list all mistakes found since the first English language edition of the book Factfulness from April 2018. These errors will not be found in most translations. If you have spotted a mistake that is not listed here, please let us know so we can add it to the list and improve future printings of the book. The English fact-question one reads correctly “In all low-income countries across the world today, how many girls finish primary school?” The term “primary school” refers to the five first school-years, roughly up to ages 11, with some variations across countries. In many countries the term “primary education” has no clear correspondence to commonly used terms in the national education system. In some translated editions of Factfulness, the term “primary education” has accidentally been translated to a well known term instead, which unfortunately refers to longer schooling. E.g. in Swedish the term “grundskola” means 9 years of schooling, and in Norwegian the term “grunnskole” means 10 years. Readers of these translations will get the wrong impression that a majority of girls in low income countries complete nine or even ten years of schooling, which is absolutely wrong! In fact, only 34% of girls in low income countries finish seven years of schooling, according to recent Data from UNESCO-UIS: Lower secondary completion rate, female, % of relevant age group in Low-Income countries. 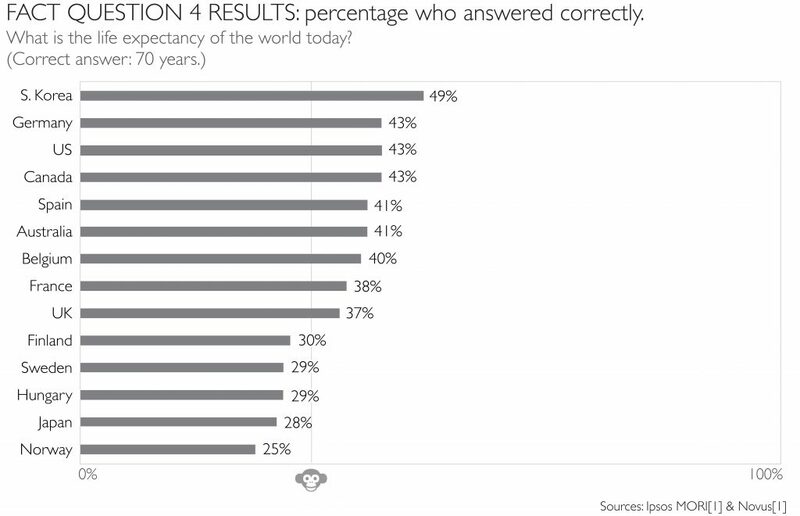 We will correct this mistake in the upcoming re-prints of translated editions and we will also run a re-phrased version of this fact-question in public polls in the 14 countries in our study, explicitly mentioning “five first grades” in the question to see if this leads to different responses. Page 62, graph Women’s Right to Vote: “out of 194” should be “out of 195”, and the number in the chart for 2017, should say “194” as only one country in the world is restricting women’s rights to vote compared to men. The improvement graph showing democracy is replaced with this graph showing improvement of number of teams in the Summer Olympics. Page 201, line 13: “in 2016” should be “in the years 2012–2016”. APPENDIX: How Did Your Country Do? p. 295, line 4-6: The sentence marked as a quotation is not a quotation. Erase quotation marks.